Man’s best friend deserves a place by our side wherever we go. But traveling with a loose dog roaming around the car can be a little messy, especially for larger families. Strap your pup in with the rest of your loved ones with one of these amazing doggy car seats! They’re all fitted to be comfortable, secure, and convenient for your family’s use. We know pets basically count as a family member, so make sure yours can go with you when you’re on fun, fabulous outings this year! All of the Dog Car Seats in our Top Ten are still some of the best the market has to offer, even after our most recent review and analysis. We know it’s important to you that you feel informed when making a big purchase, so we’ve gone through and updated our benefits data on each of our top picks. Check them out! 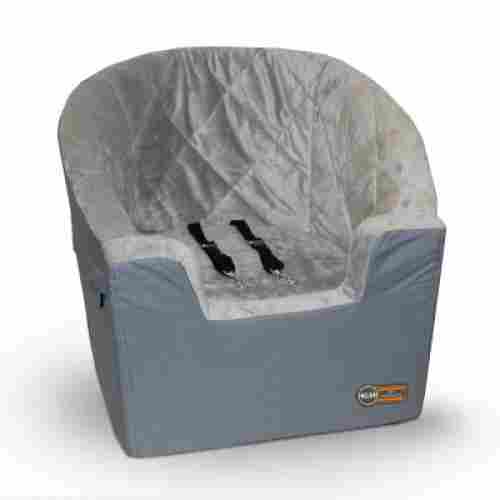 The Snoozer Lookout Car Seat is available in four terrific basic colors and has a foam form that is very comfortable. The interior is simulated cozy lamb’s wool, plus is removable and machine-washable. This car seat is one of the most well-made and comfortable seats we've seen! 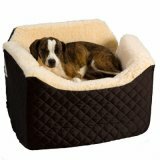 Wool keeps your pooch cozy, and the interior liner gives it a little more padding for extra comfort. Available in both small and medium sizes, this doggy seat can house many different breeds. Additionally, the simulated lamb interior will not only keep pups comfy (it looks and feels so plush!) but it will also help to keep them cozy. 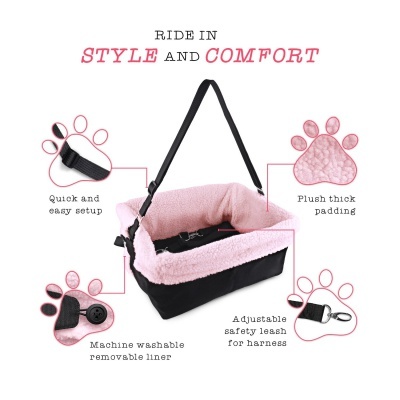 Made with lamb's wool and machine washable, this car seat is the perfect way to keep your pooch safe while cruising. The best part is that it is nice and cozy, so your pup can snuggle up while you drive. 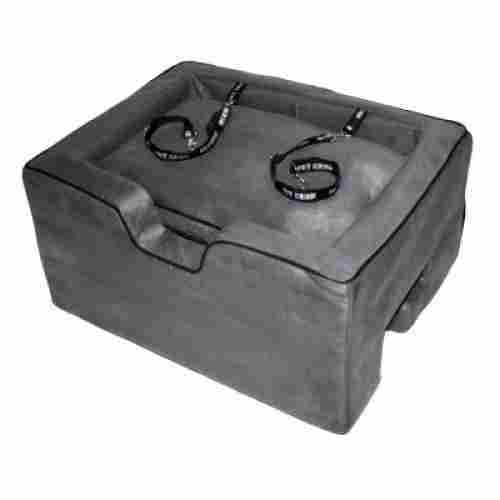 This outstanding pet booster seat comes in gray or brown colors and will fit in the back or front seat of the car. The foam cushion is removable and three-inches thick, plus the comfortable fleece lining can be machine washed. It fits in front or back seats depending on your preference and features two adjustable security leashes so your furry little friend can’t scamper around during the drive. Plus, a removable washable cover makes life easier on pet moms and dads all over. Unlike most other doggie car seats, the Bucket Booster has a front cut-out to make it easy for the dog to get in and out. While some buyers found it to be a problem, it is highly beneficial for the dog in getting in themselves. Does your doggy diva like to know what’s going on around them? This elevated seat allows them to see outside as you cruise down the highway. It also fits in the front of back seat, depending on your preference. 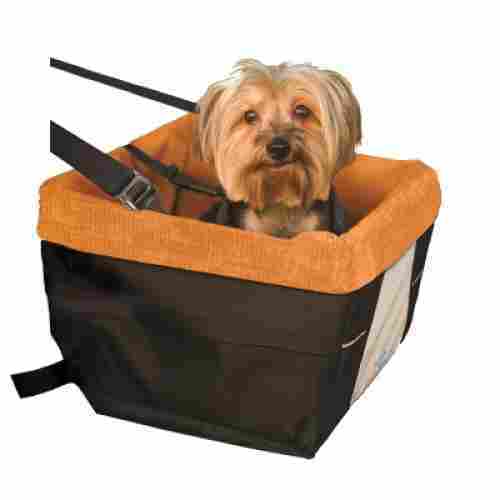 Many color combinations are available for the Kurgo Skybox Booster Seat for Dogs. It includes an adjustable tether for the seat belt and is quick and easy to install. Great for the back or front seat, it includes a waterproof exterior and has metal supports for a strong long-lasting place to sit. Metal supports allow structural integrity and an elevated seat so your buddy can check out what’s going on outside. Plus a waterproof exterior helps guard against messes. Equipped to comfortably seat dogs up to 30 lbs (though 20 lbs is the recommended maximum due to size), the Kurgo Booster keeps your precious pup buckled up safely with an easily adjustable seat belt tether that hooks up to most harnesses. We love the many colors that this puppy car seat comes in! they are really bright and beautiful colors that look great in a vehicle. Try to match your car’s interior or the dog’s sweater or leash. Terrific for medium and small pets as much as twenty pounds in weight, the Deluxe Dog Booster Car Seat is offered in two different colors. It has a strong frame constructed of metal that is collapsible for storing. This booster seat gives them a little elevation and a whole lot of comfort. 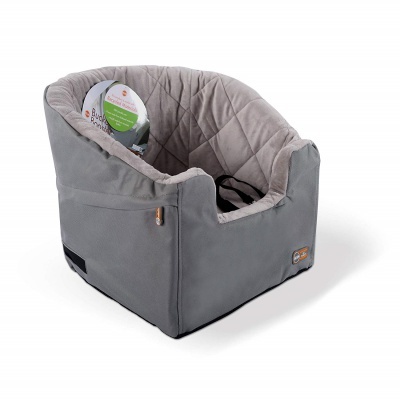 A collapsible metal frame keeps structural integrity intact while a plush interior liner keeps Spot warm and cozy. One strap fits around the back of the seat and one strap fits around the headrest. And just like that, your pup is securely buckled in. Like the manufacturer stated in the product description, most dog seats are made of strong cardboard. This one though is made of long-lasting durable metal and collapses for storage. 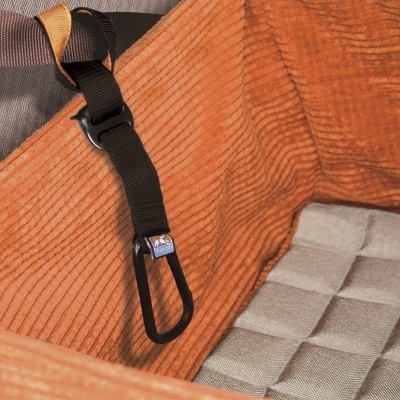 The Lookout Booster Car Seat includes a comfortable pillow that is removable and machine-washable and is offered in three nice basic colors that will match most car interiors. It comes in medium and large sizes and has a sturdy foam frame. Even though some buyers did not like the fabric of this car seat for dogs, we think it is very beneficial. The microsuede material will be cool in the summer and warm in the winter, unlike some other fabrics commonly used on dog seats. A tether can be attached to your pet’s harness to keep them securely in place and sturdy foam keeps them feeling nice and pampered. Microsuede: ooh lala. If you want to spoil your pooch, here’s your chance. This booster seat features a removable plush pillow. Made for dogs up to thirty pounds in weight, the Solvit Jumbo Deluxe Pet Safety Seat provides an elevated view out the window. Its interior is spacious and comfortable and has a plaid quilted liner. The exterior is made in a faux suede quilt material, and the seat core does not trap odors. This seat is best fit for dogs up to 30 lbs and has been tested for up to 2,000 lbs on the safety tether. With such a soft, spacey interior, we don’t think they’ll ever want to leave! 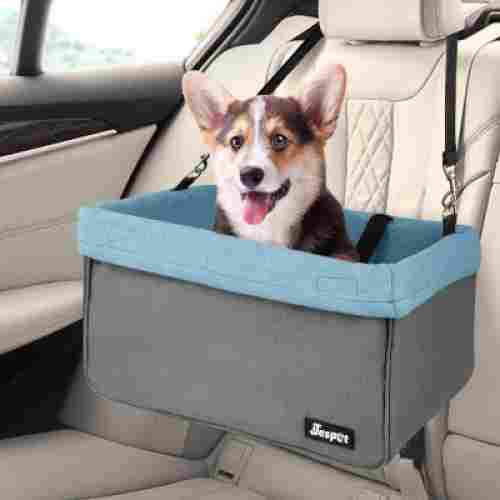 This car seat is quick and easy to assemble thanks to plastic panels and it helps to keep your pooch securely fastened where they can’t distract you while you drive. Unlike any other dog seat we have seen, this one comes in several durable plastic pieces and must be put together. That is great for when it is not in use because it could be stored so easily and compactly. 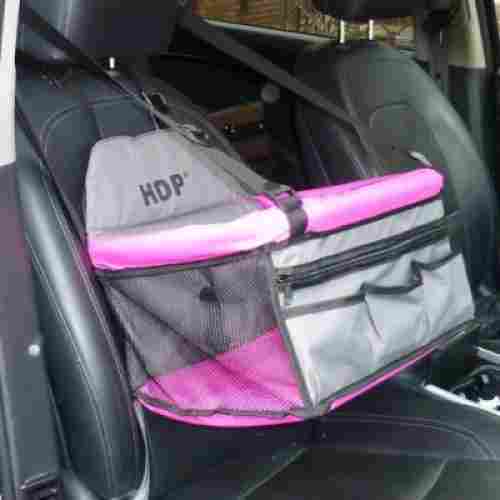 The HDP Car Deluxe Lookout Booster Car Seat is available in four great vibrant colors and has a safety strap that attaches to the pet’s collar or harness. It stores easily because it folds up into a compact form and is usable by pets up to twenty pounds in weight. 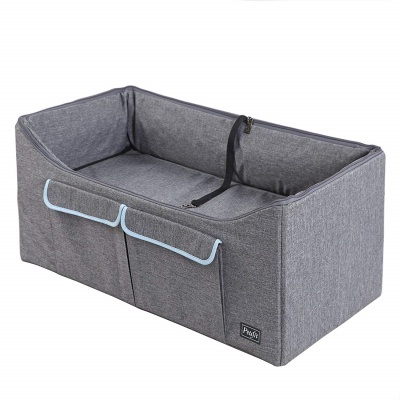 Made of light polyester, this product is also padded so your pooch can relax in style.The seat will not collapse as it has a strong metal frame, and the bottom is hard and padded. The front has a large zippered compartment and three smaller open pockets for treats and toys. 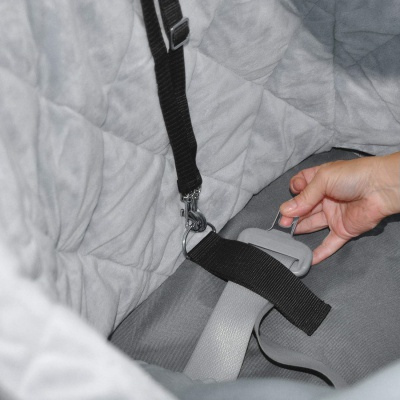 This car seat’s liner is made of polyester material that is washable and lightweight. If you have a smaller dog or are looking for a seat that can also be used for other animals, we think the HDP Deluxe Booster Seat is your answer. It folds down to 2.5” for incredibly compact storage and easy travel. Meanwhile, the metal frame and padded solid bottom keep the structure from collapsing. Attach it to your pet’s collar for security and voila! You always can use pockets in things for dogs because they have treats and toys. 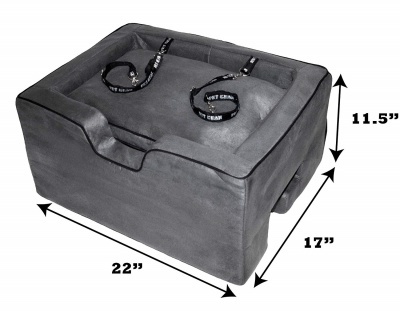 This ideal doggie seat includes four pockets in the front that can hold many things for your pup. Made for small and medium dogs, the Cozy Boost Dog Booster Seat includes a collapsible silicone water dish and a plush blanket. It comes in two great colors and includes a clip-on leash. The liner is soft, machine-washable, and removable fleece material. 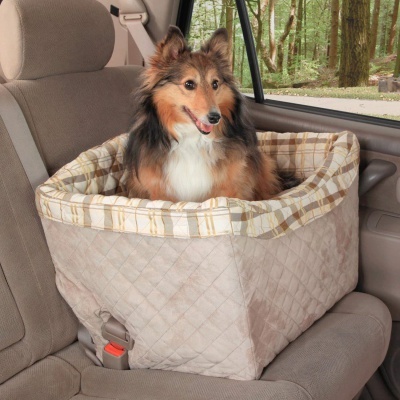 The makers of this terrific car seat threw in a collapsible pet dish and a cozy soft blanket. Both of these will come in handy for long trips in the vehicle. The exterior of the seat is water-resistant, and the height of the item is adjustable for the pet to see out the window. 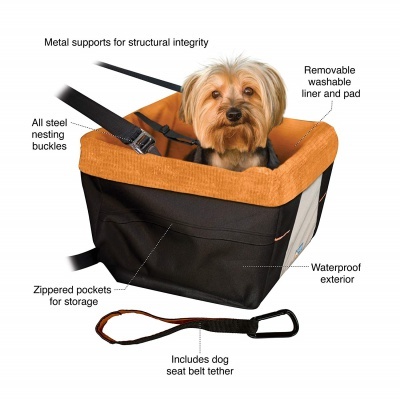 It has a collapsible metal frame and is great for dogs up to twenty-five pounds in weight. Use on the back or front seat, as it is warm for winter and cool for summer. 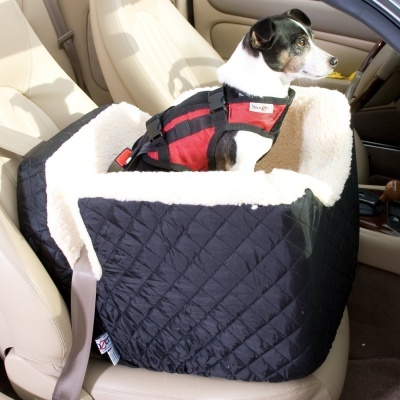 This amazing dog seat is large enough to add a blanket and pillows for long rides. This luxury booster seat comes equipped with a collapsible silicone dish, clip-on leash, and plush blanket. If you have a small-to-mid-sized dog, they’ll be living in the lap of luxury on your car rides. 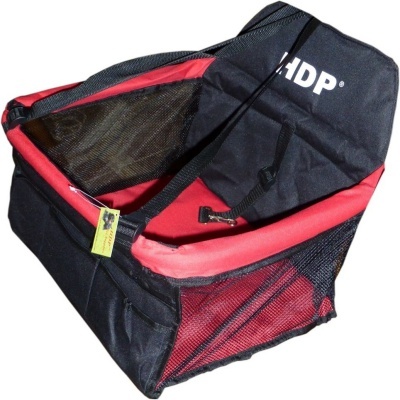 A fleece liner and strong metal frame gives support for your pooch and your vehicle. The Petsfit Booster Seat/Lookout Car Seat is comfortable and soft and has an attached leash for securing the dog. 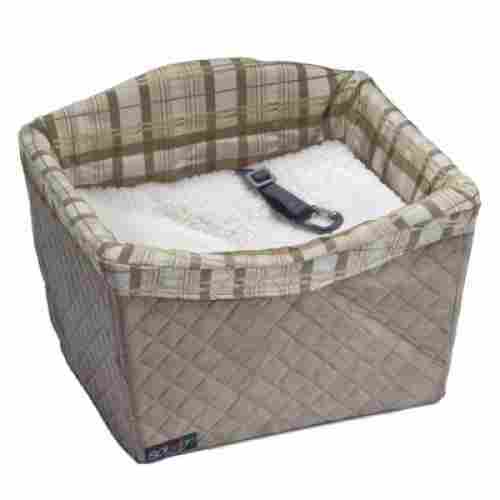 It is ideal for dogs of medium size as much as 45 pounds and has pockets on the sides for treats, toys, and poop bags. You can flip the cover of this doggie car seat for the various weather conditions. When it is cold, use the plush thick side, and when it is hotter, flip it to the smoother, thinner side. This Petsfit dog seat is able to handle a little more weight than a lot of its competitors. With the ability to comfortably and safely seat up to 45 lbs, it’s great for medium-sized or slightly larger dogs. Machine washable and thick for comfort, this car seat has it all. Side pockets can store toys and treats and there’s one simple leash inside to secure your pet while you drive. The liner is soft, plush, machine washable, and removable. The plush side is used for cold weather and the other side is used for warmer weather. It secures well in the car seat with the seat belt of the car and the headrest, and an installation video is available from the manufacturer for clear instructions. Offered in two sizes, the Jespet Dog Booster Seat with Seat Belt includes a zippered front pocket for favorite dog toys and treats. 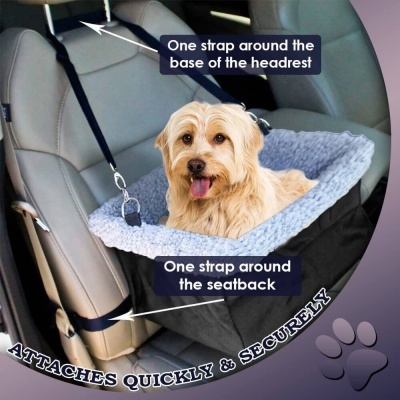 It installs easily by strapping the seat to the passenger side of the car seat and putting the dog in. The cover is machine-washable and removable, and the inside of seat is comfortable and soft fleece. Perfect for medium and small dogs, this car seat also comes with a 100% warranty, has a security belt, and is elevated for a better view, so your pup is comfortable while riding in the car. The dog will not fall or slide from the seat when out for a ride, plus this terrific seat aids the dog in looking from the window. It comes with a 100% warranty, has a security belt, and is elevated for a better view. The Jespet Dog Booster will fit in both the back and front seats of a vehicle. 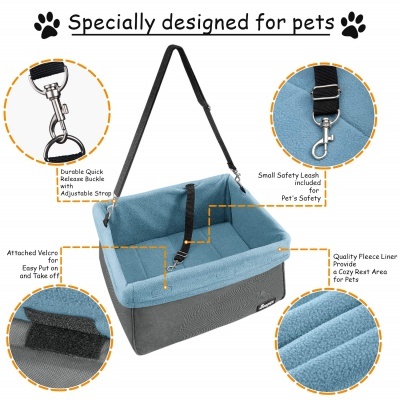 It is perfect for medium and small dogs and comes with a handy carrying bag. This adorable little booster basket installs quickly with just two straps. It can hold dogs up to 24 lbs and promises to keep them safely and comfortably seated on your journey. It’s pretty universal when attaching to dog harnesses and the front pockets can store accessories, toys, and treats. his excellent product is easy to store because the seat collapses, and it gives your pet a safe way to travel in a vehicle. It has a built-in attachment for a harness or leash for a safer ride, so you can drive safely and comfortably with your dog. The big pocket in the front of this car seat for canines is a terrific addition by the maker. 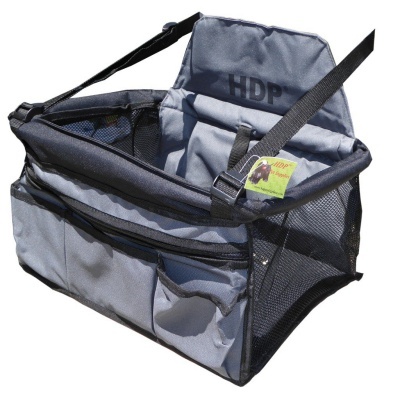 This can hold treats, toys, and even poop bags for your trusted friend as they ride along. Each of these car seats should be very comfortable for the dog no matter what the size. Most of them come in a choice of sizes, so it should not be hard to get an adequate fit. The linings of most is a soft fleece material or one of a faux suede. These are mostly machine-washable and easy to put on and take off the frames. Cushioning is provided with these and the necessary straps to secure them for a comfortable ride. 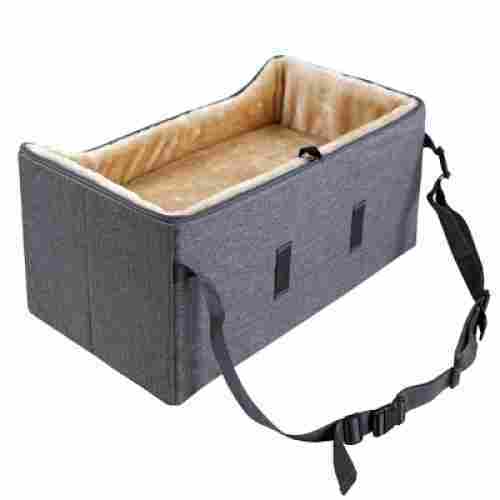 The included pockets add a level of comfort because they can hold the pet’s treats and toys. 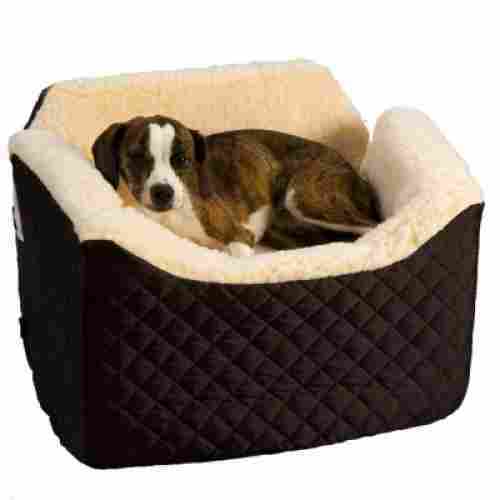 Some of the beds are large enough for the dog to lay down for longer rides, while all will accommodate them in a sitting position. All dogs should like the soft linings and the individual space to call their own in the car. While some of the seats must be assembled before use, most have either a durable permanent frame or one that collapses and folds. Once the seat is in the shape for putting in the car, they all strap in easily with the included straps for either the front or the back seats. The ones that can fit in the front seat have the additional strap that goes around the headrest of the vehicle’s seat. Ones that are suitable for the back seat just attach to the seatbelt of the car. Once the straps are secured, it is just a matter of putting the dog in and securing him or her with the security attachment. This hooks on to the collar or harness of the dog to keep them in the seat at all times while the car is in motion. It is just that easy to install and use these pet car seats to enjoy them. Materials are important in order to keep your pup comfy and happy. Whether it is made of soft, fleece materials for your pup to cuddle up in, or durable polyester for easy cleaning, materials can make or break a product. We always ensure the products we choose are made with durable and safe materials. Only the best-rated and the most-reviewed items of a category are included in our buying guide pages. We highlight the best of the best, so you can view right away only what buyers are happy with and leaving positive remarks about. We peruse the consumer feedback and the item descriptions from the makers to give you a comprehensive guide that provides you with the data you need to make the smartest purchase for you and your loved ones. We noticed that almost all of these car seats for pets come in either one size suitable for small and medium dogs or there is a choice for small, medium, and sometimes large seats. The larger ones will be too big and tall for the smallest of dogs, and the medium sizes may not fit a large dog well either. Only the best-rated and the most-reviewed items of a category are included in our buying guide pages. We highlight the best of the best, so you can view right away only what buyers are happy with and leaving positive remarks about. We peruse the consumer feedback and the item descriptions from the makers to give you a comprehensive guide that provides you with the data you need to make the smartest purchase for you and your loved ones. The dog car seat in this buying guide that has the most reviews is the Snoozer Lookout Car Seat. 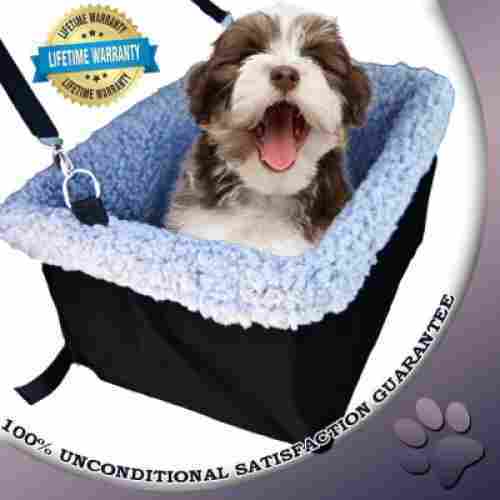 For the best rating, there is the K&H Pet Products Bucket Booster Pet Seat. 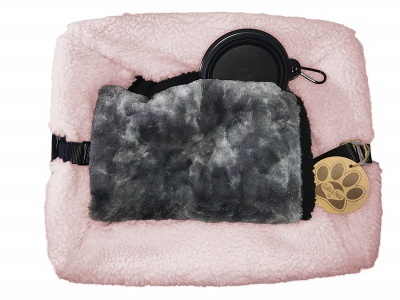 A close second is the Cozy Boost Dog Booster Seat with Clip on Leash + Plush Blanket + Collapsible Dish. These have quite high ratings from the customers who purchased them. q: What are the benefits of putting a dog in a car seat rather than just letting them sit on the seat in the car? Small dogs cannot see out of the windows well, so with them trying to see makes the ride dangerous. The car motion can be dangerous for them too. A car seat elevates the animal, so it can see the view outside the car. The clip secures them to the seat, so they will not be free and loose in the car. It is safer because the seat keeps them contained and controlled while you can calmly drive the car without any problems from your pet. q: Do these seats come in different sizes for various sizes of dogs? Yes, most offerings have at least two sizes for their products. 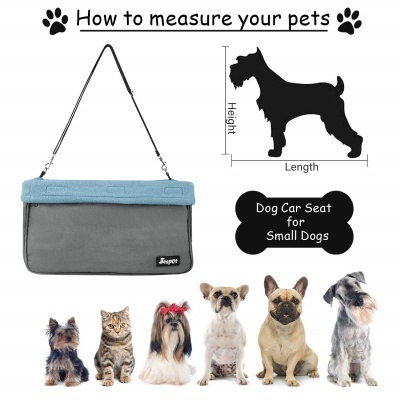 The majority of them come in small or medium sizes, which will accommodate most dogs that want to ride in the car. If you have ever noticed, it is usually the owners of small or tiny dogs that bring them for rides the most. They are easier to handle and are more apt to cuddle and behave than larger dogs. These are the dogs that are more likely to have a dog bed in the house and be used to having a certain amount of space to be in. Car seats for these smaller or medium-sized dogs are therefore offered more often than for the larger breeds. There are not many sizes for dog car seats, just like for dog beds. The choices are small, medium, and large, so whichever your pup fits the best will be the one to pick. This depends on the breed and adult size of your dog. Make sure to get one big enough for the adult size of your dog because it will not remain the small puppy size. You do not want to have to purchase another one when the pup grows up. q: Is it too late to start an older dog with a car seat? We did notice that some people commented that their dogs were too excited to sit still in a dog car seat. This was probably because they were older and had not been trained to sit still in such a seat. if the older dog is a calm dog that ideally has a pet bed in the home that it likes to get in, then it may work out in the car as well with the car seat. you never know until you try. It would be unfair for anyone to tell you that it would or would not work out until you try it yourself. q: How do you clean these car seats? Most, if not all, of the products listed, are machine washable and dryable. Some may have to be air-dried to prevent shrinking. A few could be ideally washed by hand that are made of polyester material. if the accident can be taken care of with a damp cloth and water, then that is the best way to clean. For bi-weekly or monthly cleaning of the seat liner, most can be machine washed for easy care. q: Are these seats too hot to use in the summer? No, a few of them had thinner liners that could be great for all year long use. The thicker fleece linings may be a problem in really hot climates and for very warm days, but overall the fabrics should not be too hot for the dogs. Just remember to never leave them in a hot car or leave them alone in the vehicle for the best safety.